greetings from hillsboro kansas. The birds have been slowly moving this way but i must stress SLOWLY. We did see some new birds show up north of councle grove area yesterday. marion resv. very few birds just local birds really. geese have been more active but not any new ones as of yet. We just got back from pheasant hunting in South Dakota for the opener. They say the bird count is down 64% and from what we experienced it was not that bad. We still had 3 of the 4 days as limits for our group. The rest of the guys are finishing up hunting today up there I had to get back to work! We saw more birds this year than we did last year. The number of waterfowl was not to numerous. We saw a lot of coots, and a few puddle ducks. The honkers we saw were mainly locals according to the farmer we hunt on. I think from what I saw up there it has not been a push yet. time to start getting the blind and stuff ready around here and do final preparations. Was out working the cattle this past weekend and had a bunch of blue winged teal bombard my farm pond. Pretty late to still be seeing some blue wing around here. I read they are still some in Canada as well though. We have all kind of local geese around here. I hope they hang around long enough to give us a chance when the season opens for us. We finally have a little cooler weather and they are harvesting beans and corn around here. We had Duck Dynasty day at school yesterday for spirit week and I brought in a bunch of the decoys and mojo. 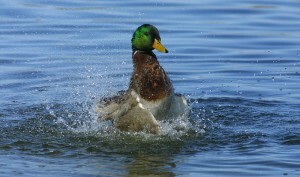 Amazing how many kids do not know what a mallard is!!!!!!!!!! Out driving around this weekend and saw several groups of cranes migrating through. We have a bunch of local Canada’s here as well. We hope to get after them before the duck opener here in the southeast late zone! It is supposed to cool off a lot this weekend, curious to see if we get a small trickle of migration. Went this past weekend and what a difference a few cool fronts make! We were covered in blue wings before legal shooting hours! We had a group of 2 come in, than a group of 12-15. Could not shoot and the dogs were eager with the first ducks of the year! Then legal shooting time came and they were out of range on the water. A few minutes later the biggest group we have ever had come in during early teal season passed over. There were about 75- 100 blue wing in it and my partner and I dropped 5. The same group came back in again! I dropped a couple out of it. Then about 7:10 we had another group of 10 or so come in. It was a great day in the blind. We went to the same spot on Sunday and only saw 2 blue wing. We each got one. that was it. Teal do not take much pressure and they seem to move on quickly. Have not talked to any other hunters yet about how they did. If I found out I will post. It was 43 degrees Saturday morning and 44 degrees Sunday morning according to the truck gauge. I hope everyone else had a good weekend as well. Went the second weekend for teal here in Ks and nothing. We did not see a single type of waterfowl. We even drove around and checked several different ponds. Went teal hunting this weekend for the opener. It was in the upper 90’s. Did not see a teal on any of our ponds. Did see a nice group the weekend before while I was dove hunting. We usually see some woodcuts as well and have to identify them se we do not shoot them! Did not see a single wood duck. We had plenty of rain at the end of August and all of our ponds around here are in good shape except some of the irrigation ponds. Going out again this weekend with the small cool front coming in mid week. Still exciting just to be in the blind with friends and the old yellow lab Nelli! Jason — teal sure seem to be behind schedule this year all across the Central and Mississippi Flyways. Hope they show up for you before the season goes out. Thanks for the update. Anybody reporting for Kansas .My bro-in-law from St.Louis hunted near Waverly on FridAY and shot limit on mallards in the morning,hunted fields in afternoon and shot his limit on canada geese. His son lives in kansas and has area to hunt near Waverly..